Todays choices are from Rich. who has had a great weekend, thanks. 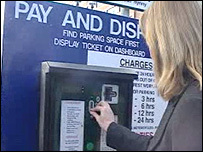 The often criticised NHS have today revealed plans that by the end of 2011, parking in Welsh hospitals will be completely free. Nearly Ã‚Â£5.5m was collected by NHS trusts in Wales in 2006/7, with much more spent in the other UK countries due to the 'tax on the sick' charges. Let's hope that the other countries' health services follow suit - because let's be honest, the NHS needed some good news. Boyo boy, think of all the money we'll save! Nutella have broken advertising rules after 'over-egging' the nutritional value, after it was hit by (wait for it...) DOZENS of complaints. The recent TV ad which claims that it can be eaten as part of a balanced breakfast has been cancelled, due to the fact that the chocolate hazelnut spread is too high in fat and sugars to warrant its assertions. Consumer group 'Which?' has branded the ad 'irresponsible', and I back that. I know I'm biased having been a sports nutritionist and PT in a previous life, but with all of the convenience food on offer, should chocolate really be allowed to be advertised as a breakfast food to our easily influenced youth, full stop? No wonder that by 2010 children in the 'normal' category of the sometimes indiscernable BMI scale will be in the minority*. Do you think kids are going to get bullied in the future for not being fat? *'Forecasting Obesity to 2010' Department of Health, 2006 - A really good, eyeopening read if interested.